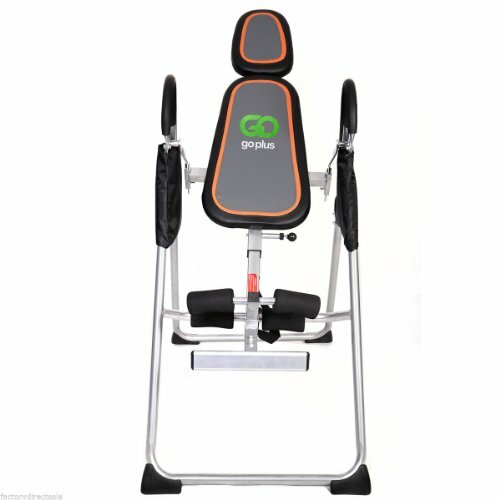 This is the Goplus inversion table. An inversion table is a gravitational device that will help you achieve this by placing you in the required "inverted" state. With this inversion table, you can relieve the stress on your lower back, and relieve pressure on the discs and nerve roots. With this heavy-duty table, you can increase blood flow to your lower spine, increase body flexibility. Your discs will recover lost moisture and to return to their original shape. Sturdy and durable, table folds for easy storage, nylon support pads, heavy duty construction. Reduces back stress, helps posture, heavy-duty steel frame, increases body flexibility, eliminates back & neck pain, stimulates blood circulation fights compression fatigue. Adjustable user heights: 4'10" to 6' 6"